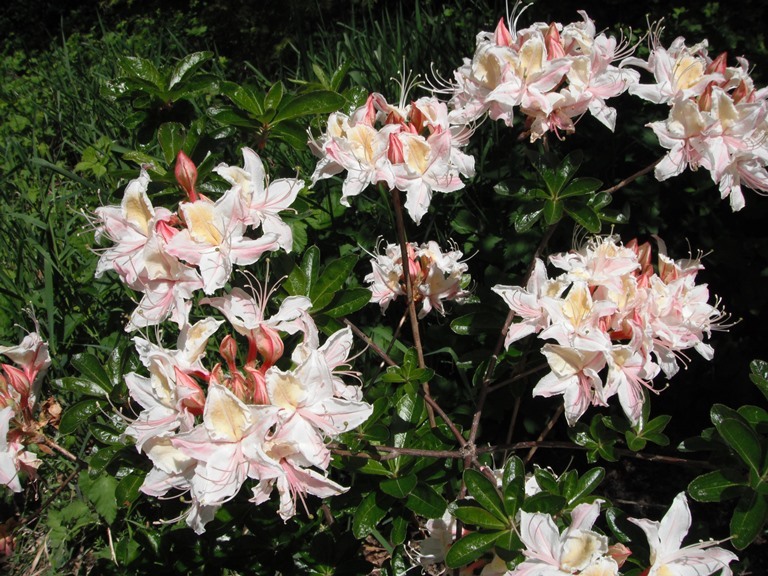 Names: Occidentale means western; so Rhododendron occidentale, literally means, “western rose-tree.” It is sometimes called Pacific Azalea or California Azalea. 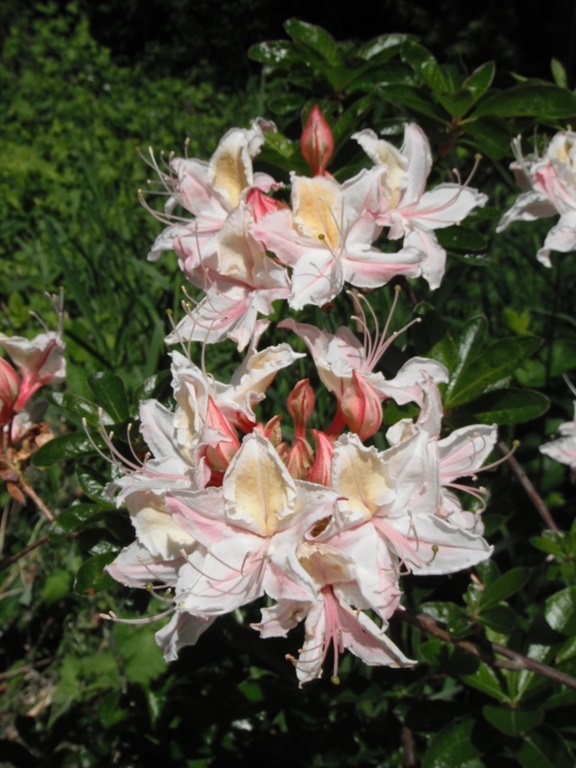 Relationships: Azaleas are divided into two subgenera (deciduous and evergreen) in the very large genus of rhododendron (see Pacific Rhododendron). This species is a parent of many hybrid deciduous azaleas. 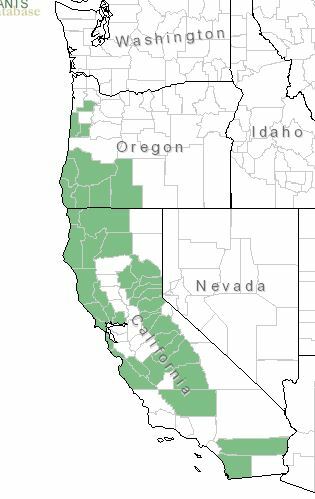 Distribution: Western Azalea is native to the coasts of central and southern Oregon and California, in the Umpqua Valley, and the Siskiyou and Sierra Mountain ranges. There have been some anecdotal accounts in the Puget Sound region. 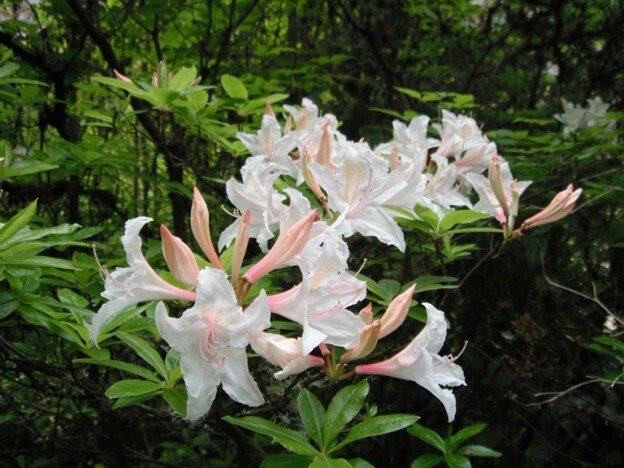 Growth: Western Azalea grows rapidly to about 9-15 ft. (3-5m) and is long-lived. Habitat: It grows in moist, open woods and streambanks. 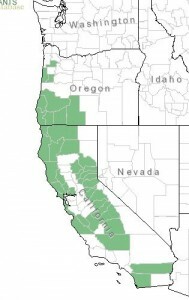 Wetland designation: FAC, Facultative, it is equally likely to occur in wetlands or non-wetlands. Diagnostic Characters: Fragrant, funnel-shaped flowers are borne in trusses and vary from white to pale rose, with or without a yellow blotch, sometimes streaked with darker rose markings. Leaves are oval to lance-shaped; downy, new leaves are clustered toward the ends of twigs, rosette-like. Seeds are borne in woody, brown capsules that open into flower-like, five-pointed stars. In the Landscape: Western Azalea is one of our most popular natives for landscapes. 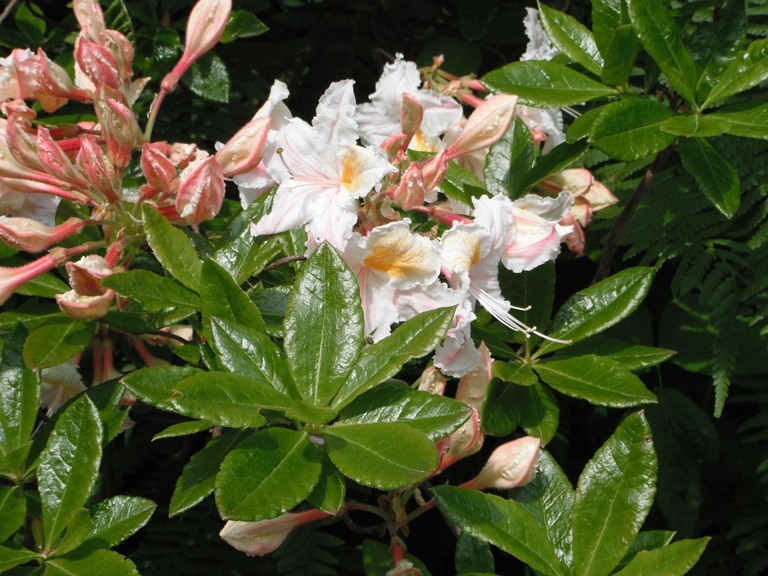 It prefers humusy, acid soil like most rhododendrons and azaleas. Its fragrant, flowers are especially enchanting. 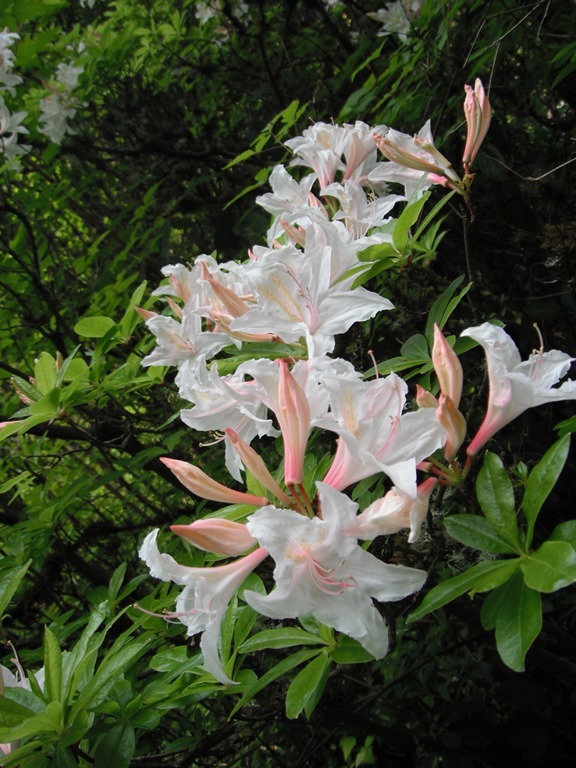 It is beautiful in a woodland setting, but can also be grown as a specimen plant in full sun. Leaves turn reddish in the fall and are often persistent in mild winters. Phenology: Bloom time: May-July. Capsules ripen: Late August-September. 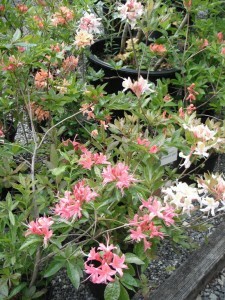 Western Azalea Hybrids in various colors. 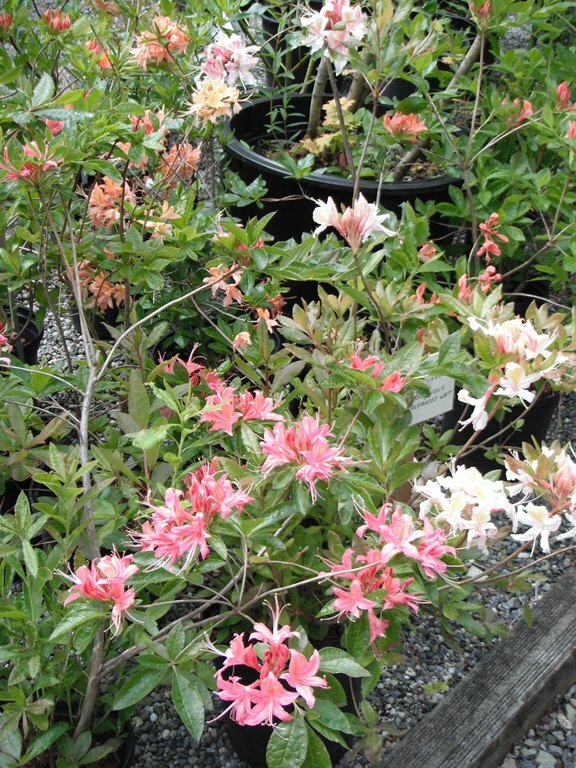 Propagation: Western Azaleas can be propagated by seeds, cuttings or layering. Seeds germinate best when sown in midwinter on a humusy, acid soil mix in a cool greenhouse. Success with cuttings is often difficult. Softwood cuttings taken in spring and treated with 75 ppm IBA stuck in a sand-peat-perlite mix, with bottom heat and intermittent mist, will likely yield the best results. After rooting, they should be kept in a cold frame over the winter. Rooted cuttings often have a low survival rate and may need extended daylengths, using artificial light, to break bud in spring. Use by People: Western Azalea flowers were used in ceremonial dance wreaths by some native tribes. Otherwise this species’ only common use is in the ornamental landscape and in hybridizing cultivated varieties for the same. 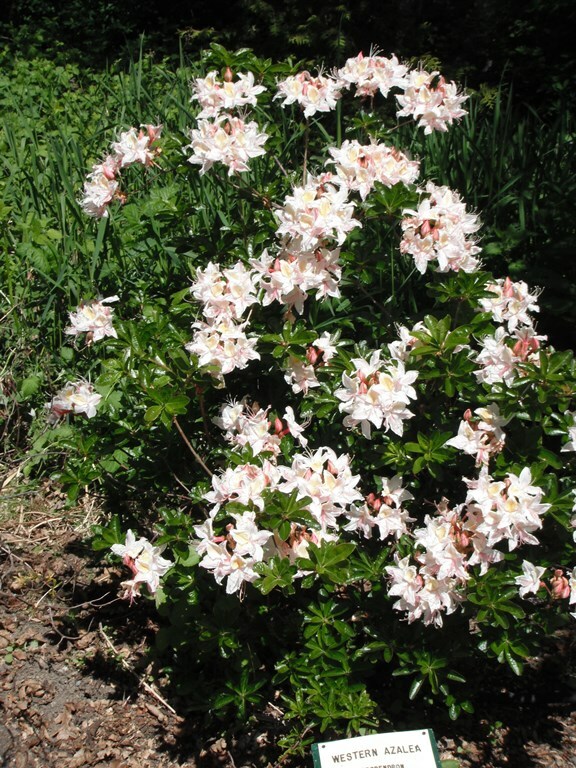 Use by wildlife: Azaleas are well-known to be toxic. Even honey made from the nectar will cause illness in people. Flowers are visited by bees and hummingbirds, the Green Comma Butterfly and the Hoary Comma Butterfly. The leaves are also eaten by their caterpillars, perhaps making the butterflies toxic to eat as well. 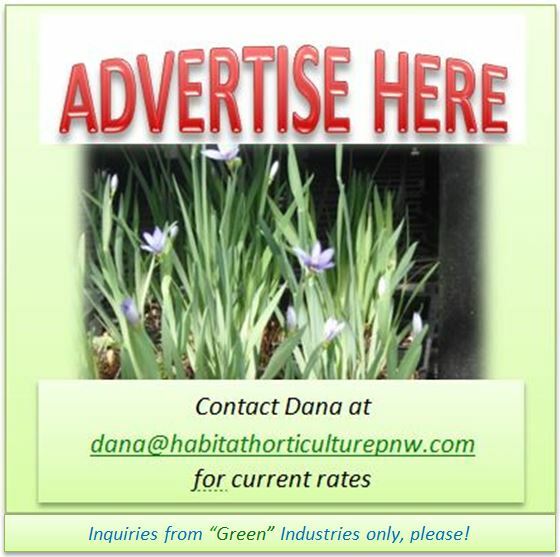 This entry was posted in Deciduous Shrubs & Vines on January 25, 2016 by habitatdana.